Riot Games has just released its latest cinematic. Awaken, which was released earlier today, celebrates the beginning of the game’s 2019 ranked season, showing off a host of characters rarely seen in previous videos and exploring the game’s lore. The video focuses on three stories. In one, Jhin performs in a ruined theatre, while in another, Draven lethargically surveys a gladiatorial battle in Noxus’ arena. In the third and final scenario, Irelia watches as Noxus’ warmongering forces invade her native Ionia. But as the video, which you can check out towards the bottom of this trailer, continues, it becomes clear that there’s far more to see. While Jhin plays, Camille arrives with a hit-squad, the famous assassin on the hunt for the psychotic performer. Riven rises from beneath Draven’s arena, piquing the executioner’s interest as she dispatches her opponents. As Irelia steps out alone against the Noxian forces, the undead general Sion charges from deeper within the ranks, battering the Will of the Blades to the ground as the fight continues around her. I’ll let you check out the rest of the video for yourself, but I’d like to highlight that Ionian segment in particular. A whole bunch of champions show up to take on Sion, which is very cool, but it’s the portrayal of Ionia itself that piques my interest. It’s no secret that Riot is working on other games, and last year one of the company’s co-founders tweeted about a potential League of Legends MMO. Awaken is one of the longest and most-detailed depictions of this part of the world so far, and it could speak to an attempt to bring some of the game’s lore to life. 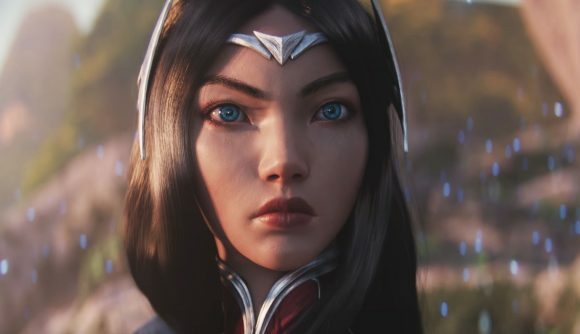 League of Legends cinematics are nothing new, of course. Last year saw the arrival of The Climb, in a nod to the game’s ranked ladder, and previous videos have seen battles rage across Summoner’s Rift.